Each year, the Florida Supreme Court and The Florida Bar give special recognition to lawyers, groups and members of the judiciary who have freely given their time and expertise in ensuring access to justice for those who otherwise could not afford it. Next year’s ceremony will be held at 3:30 p.m. on Thursday, Jan. 30, 2020, at the Florida Supreme Court, 500 S. Duval St., Tallahassee. The ceremony is open to the public. 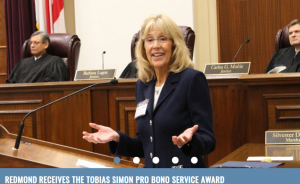 Honorees for the annual pro bono awards can be nominated by legal aid groups, fellow lawyers or anyone else who knows of exceptional pro bono service provided by a lawyer, a judge, a voluntary bar or a law firm. For circuit awards, honorees are recommended by circuit committees and approved by The Florida Bar president. A committee of the Young Lawyers Division of The Florida Bar chooses the YLD honoree. The Chief Justice’s Pro Bono Advisory Committee recommends the remaining honorees to the chief justice of the Florida Supreme Court, who makes the final decision. The 21 Circuit Nominating Committees for the Florida Bar President’s Pro Bono Service Awards consist of five to seven members each, selected by and including the circuit chair. Circuit chairs are members of The Florida Bar’s Board of Governors and are appointed by the Bar president. Nomination forms for 2020 will be posted in late summer or early fall. Nominations should be emailed to [email protected]. The 2019 ceremony was held on Thursday, Feb. 7, 2019, at the Supreme Court of Florida. The program for the Pro Bono Awards ceremony Feb. 7, 2019. Photos from the 2019 Pro Bono Awards ceremony. Download a PDF of the 56 page ceremony booklet, containing profiles and lists of winners. Important instructions: You must download the nomination form before filling it out. You will need Adobe Reader to fill out the form (it is a free download at https://get.adobe.com/reader/). If you try to fill it out the form through a browser, you could lose your work. This award is given to an outstanding attorney for each of the state’s 20 judicial circuits and to an outstanding attorney among the out-of-state Florida Bar members. Presented annually by the chief justice to a lawyer to recognize extraordinary contributions in ensuring the availability of legal services to the poor. Named for the late Miami civil rights lawyer Tobias Simon, the award represents the Supreme Court’s highest recognition of a private lawyer for pro bono service. All current recipients of The Florida Bar President’s Pro Bono Awards are considered for this prestigious award, as are direct nominees who have demonstrated exemplary pro bono service over the course of their careers. This statewide award, presented by the chief justice, recognizes a law firm that has demonstrated a significant contribution in the provision of pro bono legal services to individuals or groups that cannot otherwise afford the services. This award recognizes extraordinary commitment on the part of a law firm to provide access to the courts for all Floridians. Presented by the chief justice, this award recognizes a voluntary bar association that has demonstrated a significant contribution in the delivery of legal services on a pro bono basis to individuals or groups that cannot otherwise afford the services. This award also recognizes an extraordinary commitment to provide access to the courts for all Floridians. Presented by the chief justice, this award is given for outstanding and sustained service to the public, especially as it relates to support of pro bono legal services. Presented by the chief justice, this award recognizes an active or retired federal judge for outstanding and sustained service to the public, whether through legal or civic service or a combination of them, especially as it relates to the support of pro bono legal services. With more than 26,000 members, the Young Lawyers Division includes all lawyers in good standing under age 36 and all new Florida Bar members of any age for their first five years in practice. The award is given to the division member who best exemplifies the highest ideals of public service. The 2018 ceremony was held on Thursday, Jan. 25, 2018. The program for the Pro Bono Awards ceremony Jan. 25, 2018, at the Florida Supreme Court. Click here for a PDF of the 56-page booklet for the 2018 ceremony, containing profiles and lists of past winners. The 2017 ceremony was held on Thursday, Jan. 19, 2017. The program for the Pro Bono Awards ceremony Jan. 19, 2017, at the Florida Supreme Court. Click here for a PDF of the 56-page booklet for the 2017 ceremony, containing profiles and lists of past winners. The program for the Pro Bono Awards ceremony Jan. 28, 2016, at the Florida Supreme Court. Click here for a PDF of the 56-page booklet from the 2016 ceremony, containing profiles and lists of past winners.